Dealer progressive segments for grease and oil model ZPA, 3 segments, 1 input and 6 outputs 01 cc/cycle per outlet, maximum pressure 160 bar, with the end of the race to monitoring cycle. The main element of a progressive system is the lubricant distributor. Distributors ZP-A are used to divide and meter the lubricant in the central systems of lubrication total loss oil, grease and liquid in the systems of recirculation of oil suitable for smaller installations, as for example installations of machines and medium and large. 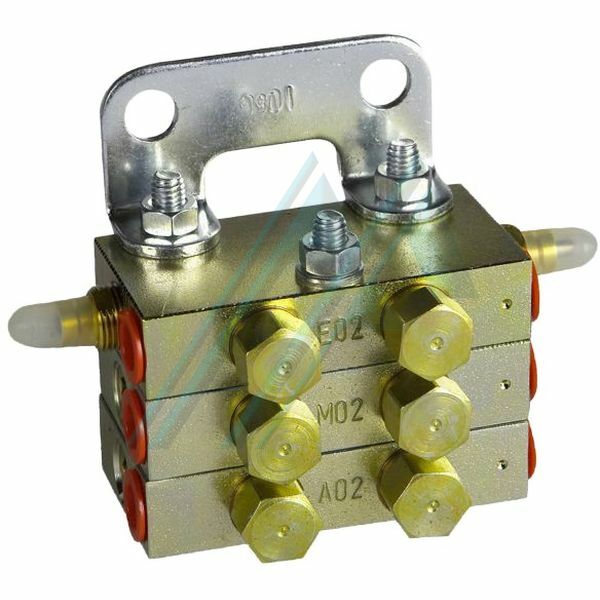 Distributors ZPA consist of several individual segments (at least 3 in the standard version) that are screwed on each other and sealed against each other. are supplied successively up to 24 points of sale as possible. This is achieved due to pistons which are moved by the lubricant under pressure, and controlled the force by others. The pistons move into their final positions, and the lubricant ahead of the piston is supplied successively to the points of lubrication. The distributor works as long as it is supplied with lubricant. Upon request, the distributor is equipped with non-return valves built in. These non-return valves, which are integrated into the outputs of the distributor, have the advantage that the distributor works reliably, even in the case of small volumes of lubricant pressures and back pressure higher in terms of the material of the line is flexible. In the event that a visual monitoring operation of the distributor is necessary or desired, the distributor must be ordered with indicators of movement. For the extended version with indicators of movement, it is possible to perform an additional power control operation by an electronic control system of switch monitoring.